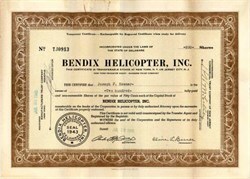 Beautifully engraved certificate from the Bendix Helicopter, Inc. issued in 1945. This historic document has the printed signatures of the Company’s President and Secretary and is over 57 years old. In 1944, Vincent Bendix established Bendix Helicopters (later renamed Bendix Helicopters Inc.). The Bendix designer, Martin Jensen, devised the Bendix Model J single-seater which used a system of coaxial rotors and was driven by a 450hp Pratt & Whitney R-985 piston engine. This was followed by the Model K - with an enclosed tube and fabric fuselage but with a much smaller 100hp Continental C-100 engine. The Model K (NX41817) made its maiden flight in June 1945, but Bendix eventually ceased operations in 1949 without achieving certification.